Entries from Digital Intelligence tagged with "google mail"
Google is rolling out a Gmail program this week that will guess which emails can be answered with a short reply and prepare a few responses on the user’s behalf. Google has added an ‘undo send’ feature to its Gmail service, letting users set ‘cooling off periods’ when an email can be recalled after it is sent. Access to Google's email service Gmail is slowly getting back to normal after a reported block on the email service, according to reports. Google has launched a new app designed to help users sort their emails more efficiently. Gmail app to sync with Outlook, Yahoo and other email rivals? The Android version of the app will be updated in the coming weeks with support for Outlook, Yahoo and other types of non-Gmail email accounts. This chart shows the top 15 mobile apps by reach as of June 2014. Facebook has the highest reach among smartphone users with 73.6% downloading the Facebook app. Google have a several apps among the top 15, with Google Play, Google Search, Google Maps, Gmail, YouTube and Google+ all featuring. 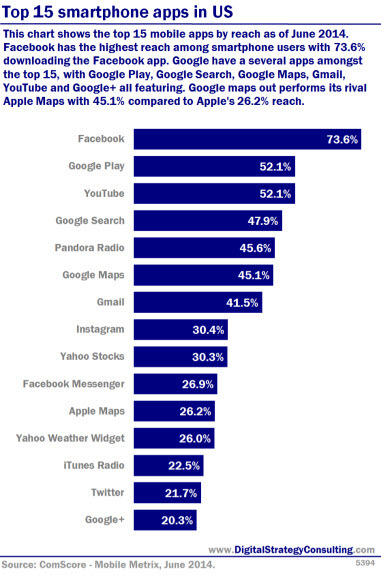 Google Maps outperforms its rival Apple Maps with 45.1% compared to Apple's 26.2% reach. messages to Gmail inboxes more successfully placed and read than any other large mailbox provider, particularly if the messages were sent to the ‘Promotions’ tab, according to new research. Google has now rolled out a new feature to help Gmail users get rid of unwanted messages more easily. Google’s Gmail app has become the first smartphone app to pass one billion installations on Android devices, it has been revealed. Google has updated its terms of service, explaining to users that their incoming and outgoing emails are automatically analysed by software to create targeted ads. Google is testing a Gmail update that will; incorporate a ‘snooze’ feature, helping users ensure they don’t miss important emails, according to a new report. Gmail tests more ‘visual’ ads: Pinterest for your inbox? In a move that could shake up email marketing, Google is testing a new ‘grid view’ for emails that appear in its Gmail Promotions tab, offering recipients a more visual, ‘Pinterest-style’ way of viewing email ads. Last week, Microsoft admitted it read the Outlook emails of one of its users in order to track down a leaked story- causing much embarrassment considering its own ‘Scroogled’ campaign criticizing Google. Now, its appears its main rivals all reserve the right to do the same thing. Google has integrated an unsubscribe option to Gmail, helping users opt out of marketing messages without having to search for obscure unsubscribe links in emails. Google has caused a privacy stir yet again, as Gmail contact lists will now include both the email addresses of their existing contacts, as well as the names of people on the Google+ social network. Here are the top digital marketing data and statistics that caught our eye. Despite fears that a segregated inbox for marketing messages would switch off consumers, Gmail users are actively searching its new Promotions tab, reading as much commercial email as before, according to new research looking at email marketing trends. Traffic to Google’s websites, including YouTube, Gmail and Google Play, account for 5.6% of the entire UK online audience, largely driven by its search business, according to new research. To coincide with its 16th birthday, Yahoo’s email has undergone its second revamp in a year with a raft of new features, as the firm looks to compete with the likes our Google’s Gmail and Microsoft’s Outlook. Google putting ‘mandatory’ ads into Gmail Android app? Google has started putting ads into its Gmail Android app that cannot be switched off by users, according to a news report. Google has come under fire for comments made in a recent UK privacy case, claiming that users of its Gmail service users should not expect privacy when they send messages to a Gmail account.